A winged caduceus (caduceus = the staff of Mercury with snakes entwined) was the ancient symbol for physicians. Together anchor and caduceus promised healing to those in the service of their country. The fouled anchor and winged caduceus were the official symbols of the U.S. Public Health Service. Cadet Nurses wore this corps device on their lapel insignia and on the silver-coated buttons of their outdoor uniform. ... The sleeve patch of the Cadet Nurse Corps displayed the eight-pointed Maltese cross. The Maltese cross was the earliest symbol of nursing. It dated back to the time of the First Crusade where it was used by the Knights Hospitalers of St. John. lower: Junior Cadet ...... Small silver Maltese crosses were used as rank insignia. One Maltese cross pinned to the center of the red epaulets indicated a Junior Cadet Nurse. Two Maltese Crosses pinned toward the ends of the epaulets 3/4 of an inch from the shoulder seams indicated a Senior Cadet Nurse. Three crosses, the third one pinned to the center of the epaulets, indicated a Graduate Cadet Nurse. No Maltese crosses were worn by Cadet Nurses during their pre-cadet training stage. A high school pledge program tried to bind high school seniors and juniors at the corps. The introduction of the outdoor dress uniform of the Cadet Nurse Corps was effectively used as part of the recruitment campaign. Leading fashion designers had been asked to develop a most attractive uniform for the new Corps. In a fashion show, held at the Waldorf-Astoria in August 1943, the various renditions were presented by fashion models. A jury of New York fashion editors finally chose the coat and suit design originated by Molly Paris and the beret designed by Sally Victor. The use of gray as color for the uniforms should symbolize "mercy, serenity and understanding" while the contrasting color red used for the epaulets should indicate "strength, courage and inspiration"
The winter and summer dress uniform as well as several accessories were issued without additional charges to Cadet Nurses. The wear of the dress uniform was optional with students except on special occasions, which were designated by the School of Nursing. The optional wear of the uniform was an important concession. Although most of the women liked the smart-looking uniform, they appreciated dressing up in fashionable civilian clothes during their off-duty time occasionally (especially when they had a date). . 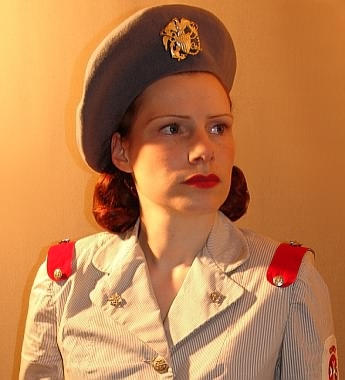 The Cadet Nurse's winter suit consisted of a single-breasted gray wool jacket with matching gored skirt. The jacket had rounded collar lapels, two side pockets with buttoned flaps and was closed with four silver-coated buttons bearing the official symbol of the U.S. Public Health Service. The epaulets were colored in contrasting regimental red. The sleeve insignia was worn on the left sleeve. A white crepe shirt with Peter-Pan-collar was worn underneath. 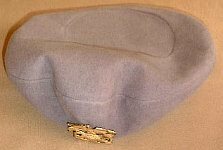 A gray Montgomery style beret with the cap device of the U.S. Public Health Service was the prescribed headgear. As footwear plain black leather shoes, with low or medium closed heels and closed toes could be worn. The hose had to be beige. Black gloves and a gray purse with the strap worn over the left shoulder were optional. Some wartime photographs show the winter suit also worn with white gloves. 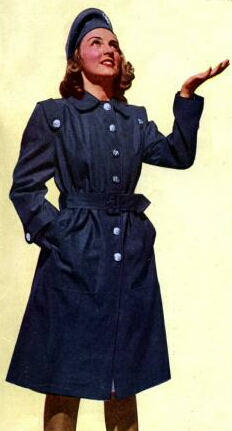 The winter topcoat (or "reefer coat") with trim guard's coat lines was made of gray velour. The coat was closed with four silver-coated buttons marked with the official device of the U.S. Public Health Service. Wartime pictures show the coat also equipped with plain gray pastic buttons as shown in the pictures below. The topcoat had two slit pockets and red epaulets like the winter jacket. The sleeve insignia of the Cadet Nurse Corps was sewn on the left sleeve. The back was belted.
. The summer suit was made of gray and white striped cotton. The cut was similar to the woolen winter uniform. 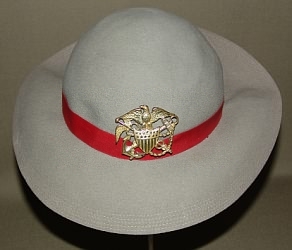 The summer suit was worn with the gray Montgomery beret or a gray felt hat with large brim and red band. ...... As footwear plain black or white shoes, with low or medium closed heels and closed toes could be used. Beige Hose, the gray or white Cadet Nurses' handbag and short plain white fabric gloves completed the outfit. .
Summer suit worn with the gray Montgomery beret. 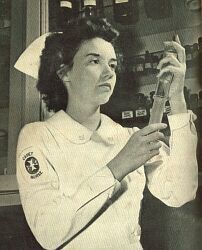 ... On duty, Cadet Nurses wore the student uniform and cap of the hospital in which they had begun their nursing career. The Cadet Nurse's lapel pins and sleeve patches worn on these ward uniforms indicated their status as Cadet Nurses.
. 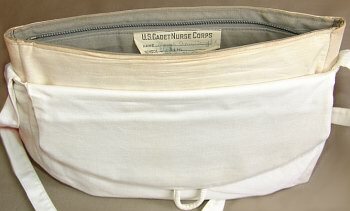 The Cadet Nurses' cap was made of gray doeskin. Sally Victor, who was the designer of the cap, had fashioned it after the one that was worn by Britain's famous General Montgomery. This was featured in many American magazines early in the war when Montgomery commanded British forces in Africa, before he became unpopular in America because of his reported arrogance toward American troops. Therefore, it was commonly called the "Montgomery Beret", which became a mixed blessing as Montgomery’s popularity went up and down in American esteem. .... 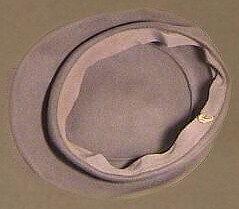 The gray felt hat that could be worn with the summer uniform had a wide brim and was equipped with a red band. The U.S. Public Health Service insignia was pinned in the center of the front. 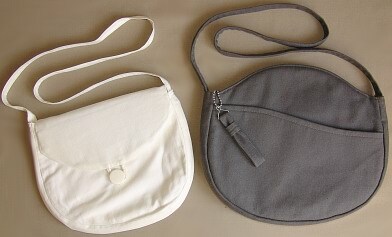 The Cadet Nurses' gray handbag with shoulder strap was made of wool. It had rounded lines and compartment on the front of the bag. 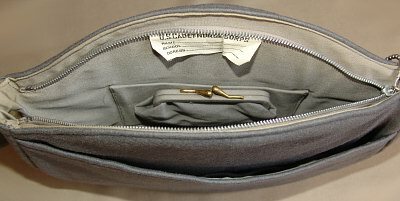 The handbag was closed with a zipper that had a self-material pull strap. A coin purse was attached inside. A white handbag could be worn with the summer uniform. The interior was removable to facilitate the cleaning. ...- if you crease only the extreme right side of your beret, keeping the front upright behind your insignia. ...- if you wear your beret insignia directly at the front or left front of your beret. ...- if your suit and reefer are freshly pressed, well fitting and spotless. ...- if you always wear the regulation white crepe blouse. ...- if your handbag strap swings straight from your left shoulder. ...- if your skirt hems hit you below the backs of your knees. 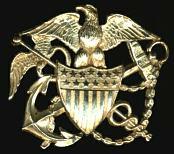 ...- if you wear your lapel insignia with the winged caduceus vertical and the anchor ring 3/4 of an inch from the point of your suit and reefer lapel. ...- if you wear one Maltese Cross centered on each epaulet while you are a Junior Cadet; two Maltese Crosses 3/4 of an inch front an back of your shoulder seams when you are a Senior Cadet. ...- if you sew your sleeve emblem exactly three inches below your shoulder seam. ...- if you wear your silver lapel pins and sleeve emblem of your outdoor uniform on your indoor uniform BUT only in the places designated by your school of nursing. ...- if you stock up on plain short black leather or fabric gloves for winter - short plain white fabric gloves for summer. ...- if you stick to plain black leather shoes, with low or medium closed heels and closed toes for your winter uniform. For summer, you may wear black or white shoes but in gatherings of any sort, all Cadet's shoes should be the same color. ...- if you select beige stockings unembellished by clocks, ribbing, or other decoration. ...- if you allow your hair to touch the back of your collar. ...- if your make-up gives you a technicolor look. ...- if you substitute dickies or non-reg blouses for the uniform white crepe blouse. ...- if you wear ear-rings, bracelets, necklaces, other service insignia, conspicuous rings other than wedding, engagement or class rings. ...- if you affect long, brilliantly polished finger-nails. ...- if you wear ankle socks, lace or mesh stockings. ...- if your shoes have spike heels, open heels or open toes. ...- if you appear in public without your beret - ON YOUR HEAD. ...- if you remove your jacket in public. ...- if you drape your reefer, raincoat or suit jacket over your shoulders. ...- if you wear your jacket, reefer or raincoat unbuttoned - your raincoat belt unbuckled. ...- if you chew gum on the street. ...- if you receive or give a military salute. ...- if you combine any article of civilian dress with your uniform. Tiny snaps sewed on the underside of the front of your Peter Pan collar will keep it lying flat beneath your jacket lapels. Snaps also should be sewn on the underside of the red epaulets of your summer uniform so that they will not slip off your shoulders. If the lacquer chips off your metal buttons, dip them in acetone (nail polish remover), then in a warm solution of soap and ammonia which removes the tarnish. Dry them thoroughly and cover them with a thin film of colorless nail polish to prevent them from tarnishing. Summer uniforms require careful laundering. Be sure to remove shoulder pads, epaulets and metal buttons before having them washed. Never let your summer uniform be starched. Ask your Director to tell you when she would like you to change from winter into summer uniform and vice versa. To reorder at your own expense extra parts of your winter and summer uniform, write the J.C. Penney Company, Dept. W., 330 West 34th Street, New York, N.Y. Nursing is hard on shoe leather. If you need another pair of shoes, present your case to your rationing board. A pair of light suspenders attached to the waistband will keep your skirt from twisting and sagging. Be sure to keep your suspenders out of sight. You may carry an umbrella when it rains. You, in your uniform, are the Corps' best recruiter. Stand straight and proudly with your shoulder back and your arms swinging freely from the shoulders. Remember that handholding, arm-around-the-waist strolling do not go with a uniform. White gloves and shoes require operating room cleanliness. Always keep them white as white." (Dress regulations quoted from: "Wear It Proudly Wear It Right U.S. Cadet Nurse Corps" by the U.S. Public Health Service - Federal Security Agency) .